Queen + Adam Lambert Give a Taste of the Tour! You are here: Home / Tours and Live Performances / 2014 Queenbert Tour / Queen + Adam Lambert Give a Taste of the Tour! 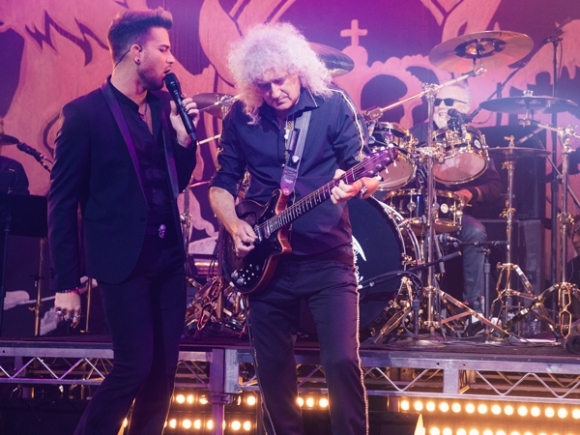 From inside Burbank’s iHeartRadio Theater in front of 500 lucky contest winners, Queen and their new prince, Adam Lambert gave the crowds a sampling of the upcoming North American Tour yesterday, with eight seven classic hits and a sort of new one. And judging by the crowd’s reaction, the USA is going to be a very happy place this summer! I’ve heard the tour will be a 3-hour show! Kind of Gilligan-esque! This version was a bit sedate, without the costumes we’ve been hearing about. So there’s definitely some surprises still to come! Below is a full video of the set, complete with an interview introduction, hosted by Motley Crue’s Nikki Sixx. I am so stoked. I can’t wait until this Thursday. I’ll have to tell you what it’s like when I come back from Chicago. I don’t have great seats, but oh well, I’m sure it will be wonderful. Thanks a million once again Carol! I’m OVER THE MOON EXCITED!!! Adam & Queen play here in Vancouver, Canada on Sat June 28…ONLY 12 More Sleeps! I’m working on my outfit! I dress very much inspired by Adam & this time (been to one other of Adam’s concert here in Vancouver) I will really play up the eye make-up much like the cover of “FYE” Album. If this tour doesn’t knock off the socks of North America…I don’t know what will !!! Hoping this exposure will be a strong & wonderful interlude… for his new music to come & be played on the radios across the WORLD! Bring it on Adam Baby! Adam ( YES & Queen) ROCK!! YAHOOOOOOO!!! That VOICE…….i’m speechless……this tour is going to be EPIC…..and i can’t wait! Detroit, The Garden AND Mohegan Sun……i’ll be there!!!! Don’t think I ever thanked you for following Adam Lambert like you have. The computer is my only connection to this amazing talent. After hearing them together in Vegas, I even made my husband a fan, which was easy since they were the best sounding group of the night ! Now I’ll be dragging him to 3 shows ! It was sad to read some of the negative comments about this beautiful voice and even harsh words for Brain and Roger, I’m so happy those people won’t be at the concert, it will be their loss. I’ll be going with my granddaughter to Chicago, dragging my husband to Vegas, perhaps we’ll meet, then on to New York City ! I have one huge request, do you think you can ask them to make a DVD of one of their performances ? Now that would be the ultimate ! Adam…you found your voice a home…stay there!!!! Love it and thank you! Wow, I can’t believe it’s coming up so fast! So glad that the touring is beginning! Are they , by chance, coming anywhere near North Carolina??? Pleeeeeeze! Be sure to let us know in time to get tickets! Onlything I have to wonder is what Nikki Sixx thought of Adam!! !